This review was originally published on my blog on 16th March 2015. You can find it here.When I heard about this book, I was instantly intrigued. I loved the sound of the summary and how mysterious it all sounded. I already wanted to know what was going on and thus I couldn’t help but make sure I read this book. I’ve never read anything by M. Maitland DeLand before so I had no idea what to expect with the writing. Fortunately, this book blew me away. It was an addictive, well-thought-out, brilliantly written novel that completely captured my attention. I read it in just two days – which is no easy feat this days – as I just simply couldn’t stop reading or thinking about it.What made this book compelling was the plot. Throughout the book, you’re kept on the edge of your toes as the main protagonist tries to work out what the hell is going on. There is a lot of tension, a lot of character development and everything just ties together so unexpectedly. I loved the way that you are trying to work out what’s going on and as you do so, you end up double-guessing yourself and just wondering if everyone is the enemy. The plot is enticing and full of mystery that really made the book very entertaining.There was something so wonderful about all the characters in this book but what helped my enjoyment of this book immensely was the powerful main protagonist; Kate. She was driven, stubborn, loyal, protective and just really grew throughout the book. I instantly connected with her and her narrative voice – third person but in Kate’s POV. I thought she was a strong character and I couldn’t help but find myself emotionally invested in her life. I also enjoyed all of the character relationships in this book. In a way it reads like a book in the middle of a series but it isn’t. What I mean by that is that all the relationships – and characters – felt well-developed and it felt like you had been reading them for years. The only small issue I had with the characters was the slight insta-love plot but that did eventually grow on me by the end.I very much enjoyed this book and am very glad that I got a chance to read it. It was captivating and powerful and was just a brilliant piece of entertainment. I instantly got hooked on the story and the characters and just had to know what was going to happen next and how it was all going to end. And the ending I did really enjoy. I loved how it all came together and how much all of the characters had grown throughout the story. The writing style of this book was easy but also in-depth and I just found it to be a fantastic book. I would highly recommend this book and will definitely be keeping an eye out for more books by this author. I usually read historical fiction, but once in awhile I like to read a medical thriller. Saw this on my bookshelf and decided to give it a go. The book starts out with a nurse noticing that a patient is being prepped for a surgery that she feels is a mistake. Besides that the doctor doing the surgery is not the patient's doctor. The doctor of course is not happy with a nurse telling him what he should and should not be doing. The surgery goes forward.Gwendolyn Cartwright is the patient being operated on, she is a young rising country star who only has a 20% blockage and that does not warrant an angioplasty especially at her young age. There are many risks related to any surgery of course but she was told by her doctor that this was a needed procedure.Kate Katelinson is an investigative reporter looking for a piece to write that is not a fluff piece. She is at the hospital and runs into an old college roommate who she has not seen in 10 years. They had a falling out and had not been in touch. Kate is concerned for her friends demeanor and she starts questioning her friend. What her friend tells her has Kate's wheels rolling and she starts an investigation into why there are so many angioplasties being done at this particular hospital.While investigating she becomes embroiled in an infatuation with a hospital exec. She really is not ready for another relationship, as she recently broke up with her boyfriend. Can she trust this man though, he works at the hospital and should know what is going on. As she continues into her investigation, one of the people at the hospital that she coerces into helping her with information, dies. To make matters worse, Gwendolyn also dies and this creates a scary situation for Kate. She does not know who to trust and she doesn't believe that these people died of natural causes, she thinks they were killed.What ensues is a fast paced thriller that will thrill any fan of medical thrillers. Characters are believable and well written. The medical aspect of the story is also well written, but of course it would be, the author is an M.D. and she uses her expertise brilliantly. I like a story that moves along and this one did for me. I look forward to the next in the series. A good nurse may question a doctor if a surgery seems unnecessary. A good doctor may revisit the records before proceeding. Nurse Jan Peters doesn’t think the angioplasty is necessary for Gwendolyn Cartwright. The test results showed only a small blockage. She approaches the doctor. He is arrogant and proceeds with the operation. Gwendolyn bleeds out; she barely survives the surgery and is moved into the ICU. Gwendolyn is a rising country-blues singer.Community Health Care Int’l bought out Nashville Mercy. It’s big news and Nashville Herald editor Ed Miller, sends journalist Kate Katelinson to interview Bradley Wickham, a hospital executive, for the paper. Mistakenly, Jan Peters, Kate’s roommate from college, thinks Kate is there about Gwendolyn Cartwright. She speaks out of turn. Kate begins to investigate. The ‘powers that be’ contact the editor. He tries to pull the plug on Kate’s snooping. She continues to investigate on her own. Bradley and Kate become interested in each other. He appears to be helping her, but … can she trust him?Nashville Mercy is a debut novel for M. Maitland DeLand, and the first in the Kate Katelinson series. The mystery was intriguing. As Kate was wondering who she could trust, I found myself asking the same question. Kate is a good lead character and once she’s onto something, she won’t let go … even if it means her job. The cover actually threw me; the hat makes her appear more like an equestrian. I rated the novel at 3.5 out of 5. I received this book as a Goodreads Firstreads. While I see where the author wanted to go in this medical mystery, I had a hard time staying focused on the main plot due to distractions in the storyline. Kate Katelinson is an investigative reporter looking into a suspicious rise in the number of unnecessary angioplasties being performed in Nashville Mercy, and the subsequent complications and death of a popular country music singer. Unfortunately, the main character was not believable as a reporter or as a professional woman. She has a tendency to go solo on the investigation, falls in love at first sight with a prime suspect ( and he does the same! ), and has 1-1 confrontations with suspects during which she divulges her suspicions and findings. She gains access to secure areas within the hospital with little effort, she appears to work this case 24/7, and she repeatedly puts herself and the investigation at risk with unprofessional, amateur antics. An organized, believable, in depth analysis of the primary characters and investigation with less fluff would keep my attention longer. 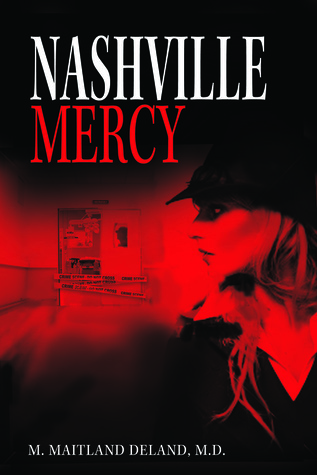 "Nashville Mercy," the first book in the Kate Katelinson mystery series, had me on the edge of my seat the whole time! M. Maitland DeLand - M. Maitland DeLand, M.D. makes her novel debut with Nashville Mercy, the first book in her Kate Katelinson murder mystery series. She is also the author of several children’s books collections, including The Great Katie Kate books focused on educating children about medical conditions.Dr. DeLand is a radiation oncologist and founder of OncoLogics, a group of cancer treatment centers in the southern United States. A leader in her field, Dr. DeLand is chairman of the Health Education Authority of Louisiana Board and also serves as a member of the BreastCancer Professional Advisory Board. She’s an active philanthropist, who is passionate about supporting diabetes and cancer prevention programs, as well as the special needs of children. Her experience in the medical field is prevalent in the stories she writes.She also finds ample inspiration for her writing from her deep love of southern culture and colorful southern personalities. Dr. DeLand divides her time between Lafayette and New Orleans, Louisiana and Nashville, Tennessee.She spends her free time growing her fine antiques and art collection. A classic movie buff as well, Dr. DeLand is a regular at the Turner Classic Film Festival. She also never misses Amy Grant and Vince Gill’s Christmas Concert held in Nashville every year.